Modern Real Estate Practice has trained more than 3 million professionals since 1959. 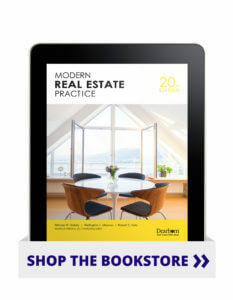 Updated to maintain current legislation and market information, and to include the newest forms and web resources, this eBook will provide the best foundation possible for aspiring real estate professionals. Each unit includes an overview of contents that highlights the topic and explains how it relates real estate law, regulations, and principles to the practice of real estate. Additionally, there are video and audio clips to reinforce important topics (See “Video Library” below). With this instantaneous delivery format, students can study anytime, anywhere. Additionally, the included QBank gives students the ability to create customized tests from hundreds of questions.